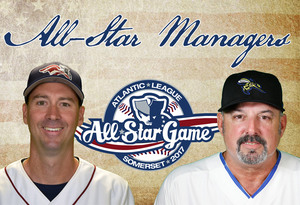 (Bridgewater, N.J., June 14, 2017) - The Somerset Patriots and the Atlantic League of Professional Baseball have announced that Brett Jodie (Somerset Patriots) and Gary Gaetti (Sugar Land Skeeters) have been named managers of the 2017 Atlantic League All-Star Game. This is Jodie's fifth season as the Manager of the Somerset Patriots, following seven seasons as the team's pitching coach. He led the team to a season record 90 wins in 2013, his rookie season in the position.